All good things must come to an end, and today it’s the end of the Macintosh ROM-inator II SIMM and SIMM programmer. The DIY ROM-inator I kit was discontinued a year ago, and now the ROM-inator II is also being retired. I hate to see it go, but as I’d cautioned more than year ago, this was inevitable. 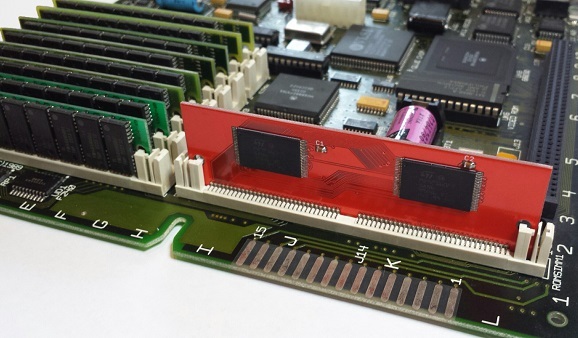 The ROM-inator II SIMMs (both standard and MEGA sizes) use a set of 16 megabit 5 volt flash memory chips to interface directly with the Macintosh bus. There was only one manufacturer still making this chip, and they moved it to “end of life” status in March 2018. Supplies dwindled, prices went up, and now they’re all gone. The 64-pin SIMM socket needed for the SIMM programmer became similarly hard to get, with only one known remaining supplier with a finite number of new-old-stock parts. Both technical challenges might be solvable, with enough effort. Perhaps level converters with 3.3 volt flash memory could be integrated on the SIMM. The top edge of the SIMM might be redesigned with a different edge connector to fit a programmer socket that’s still commercially available. But candidly, the ROM-inator was always a somewhat poor value proposition for me, requiring more effort to maintain and support than was reasonable given its sales. I’m not interested in a big new engineering effort to redesign the hardware now. There are also some issues on the software side that would need attention, if the ROM-inator II were to continue. There’s an unknown bug involving the SIMM programmer’s bootloader, which often causes the programmer to fail to be detected by the software. On MacOS Sierra and later, the software requires an awkward series of quitting and restarting before it will successfully connect. The driver and software application also need to be digitally signed, to shut up the warnings from the latest versions of Windows 10 and MacOS. Smaller capacity 5V flash memory chips remain available, and I could conceivably design a “ROM-inator II Mini” with 512KB or 1MB of total storage. That would be enough for a modified system ROM with the new startup sound, new icons, HD20 support, and 32-bit clean ROM. But it would leave no space available for a ROM disk, and no way for users to reprogram the SIMM. And there’s already somebody on eBay who’s selling almost exactly that. Thanks, ROM-inator. It’s been a fun ride! That’s so sad, but like you said, inevitable. I wish I could get the MEGA and a programmer, but I guess it’ll be too difficult to obtain now. Since you are ending this, it would be nice if you would open source the design, like you did with Yellowstone. The key parts of the ROM-inator II design are already public, and are based on Doug Brown’s earlier design, as described on the ROM-inator II page. I have 2 MEGA’s and a programmer that I use with my IIsi and my SE/30. I recently used SIMMProgrammer v1.1.0 on macOS High Sierra (10.13) to reprogram one of the ROMinators, with no issues. I was thinking they’d serve me (and my Classic Macs) well for many years to come. Under what circumstances would the SIMMProgrammer stop working on macOS? Does it break on macOS Mojave, for instance? Are there any EOL parts issues coming up with your other products? Parts sourcing is always a challenge when you’re designing hardware for 30-year-old computers. A few years ago The DB-19 connector went extinct in the wild, and I had to commission the manufacture of 10000 new ones. I guess it is a LOT more difficult to commission the 5V flash for the ROM-inator? How about a SIMM to microSD adapter? Then a SIMM programmer wouldn’t be needed anymore. Do you think FeRAM could be used instead? I think there are ICs on the market supporting 5V. Or plain old SRAM and a backup battery? That might open up the possibility of being able to write to the ROM from the Mac, as in the ROM hack for the older Macs.